George R. Barker, 92, formerly of Marble Hill, passed away Tuesday, December 23, 2014, at The Gardens Assisted Living in Ocean Springs, Mississippi. George was born August 1, 1922. 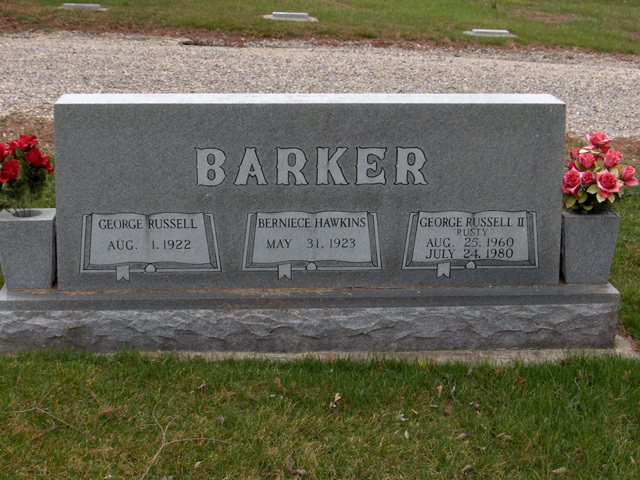 He was the son of Thomas Rufus Barker and Estella Odessa Miller Barker. He spent most of his life in Marble Hill, where he attended the schools until graduation and then joined the Navy in the early years of World War II. Later he was sent to London, where he served as an administrative assistant helping to type up D-Day orders and plans. As his children grew up and realized their father was active in much of the early part of America's participation in the war, they constantly requested he tell them stories. He rarely spoke of what he saw while in London, but he did discuss being sent to bomb shelters over and over during air raids, seeing friends and others killed by bombs and having to spend hours on a life raft in the North Atlantic when his mine sweeper was cut in two. George married Norma Berniece Hawkins on July 1, 1945, while he was in the Navy. They started their married life in Pensacola, Florida, and lived there for a year until George finished his stint in the Navy. They returned to Marble Hill and started their family shortly after with the birth of their first child, Joyce Ellen. They both worked in the furniture store owned by Harry and Pearl Hawkins. Bernie also taught in the local high school. By 1950, George and Berniece had taken over management of the furniture and appliance store, and the Hawkins had moved to St. Petersburg, Florida. George was involved in Rotary Club, other business clubs and also bowled regularly in the local bowling leagues. He later served as the president of the school board. He also was Sunday school superintendent of the Lutesville Methodist Church and taught a class for young adults. In 1998, he was voted "Business Man of the Year" by the local chamber of commerce. George was always an avid sports fan and attended many volleyball and basketball games as a Woodland fan. He and his wife, Bernie, retired to St. Petersburg in 2000, where they continued to be sports fans watching the Tampa Bay Buccaneers and the Devil Rays baseball team. In 2014, the Barkers moved to Ocean Springs in order to be near their daughter and son-in-law, Marc and Becki Massengale. He was preceded in death by his parents; a son, George R. "Rusty" Barker; and a daughter, Mary Lisa Jones.